US Secretary of State Colin Powell has cancelled plans to attend the closing ceremony of the Olympic Games this weekend, citing a busy work schedule. 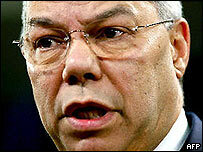 A state department spokesman said Mr Powell had called off the visit due to the "press of business in Washington". The announcement came only hours after clashes erupted in Athens as protesters rallied to condemn the planned visit. Marchers shouted angry slogans against the Bush administration and its operations in Iraq and Afghanistan. The BBC's Richard Galpin writes from Athens that the cancellation of Mr Powell's visit is highly embarrassing for the Greek authorities, coming after what has otherwise been a very successful Olympics. The protest movement has hailed the US decision as a "huge victory". The state department said that Mr Powell had informed Greek Foreign Minister Petros Molyviatis that he would not be able to travel to Athens. A spokesman for the department, Kurtis Cooper, was quoted by the Associated Press news agency as saying the anti-American protests in Athens had "played no role" in Mr Powell's decision. "The secretary considered a number of factors," he added. Events in Iraq and Sudan, he said, required the secretary's "close attention". Mr Powell had been due to meet Greek Prime Minister Costas Caramanlis and US athletes participating in the Games. In a letter, he thanked Greece for its "especially successful and secure organisation of the Games". Friday's march through the centre of Athens attracted members of the anti-war movement, anti-globalisation activists and anarchists. Protests continued into Saturday with an anti-Powell banner appearing on the city's most famous monument, the Parthenon. 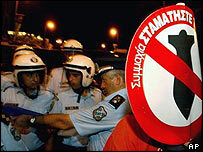 One of the organisers of the demonstrations, Yiannis Sifakakis, said the cancellation of the visit marked a "huge victory". "Of course, the cancellation was linked to our protests," he told Reuters news agency. "It is very clear why he is not coming even if he is trying to come up with excuses. But whenever he should decide to come we will lay on the same welcome." "For protesters, this is a victory"